I'd be curious to see what a year in the DC Universe written solely by Christopher Priest would look like -- a year in a place where Batman's nocturnal activities make him so tired he can't adequately lead the Justice League, a place where Wonder Woman can be felled by a bullet's ricochet, a place where the Justice League is mistrusted by the U.S. government and proven inadequate on the world stage. Priest's Justice League is kind of the anti-Authority, for better or worse; rather than enforce their will on the world, it takes only one bad day to make clear their global impotence. It's a clear law of DC Universe physics that Batman, crimefighting at night and sleeping during the day (except when stories need him not to be), must not be affected by this schedule, nor show the human wear and tear that swinging from rooftops would effect on a normal person (except also when the story calls for it, and often swiftly resolved) -- else these fanciful stories could not be told. At the outset of the story concluded in Justice League Vol. 7: Justice Lost, Priest causes that very thing to happen, as Batman's tiredness leads to the death of a nun -- a nun(!) no less, Priest bludgeoning the walls of the fanciful with a dose of the outrageous. All is forgiven and forgotten by the end, of course, because otherwise this very serious stipulation -- Batman: Ineffectual? -- would require its own multi-series Bat-family event. To that end I'd love to see Priest let loose over the whole DC Universe proper; though he gets about a year's worth of one title, the scope is not nearly enough to realize the full implications of how Priest cleverly begins to take the DC Universe apart brick by brick here. In Justice League Vol. 6: The People vs. the Justice League, Priest focused largely on the League's interpersonal failings -- Batman's sloppiness, Flash's foolhardiness (both again magnified, even created just for Priest's purposes), and the threat of a deranged fan with all the League's secrets because he was contracted to help build the Watchtower, another suspension of disbelief impossibility that Priest makes concrete. In Justice Lost, the problems are geopolitical, racial, and socioeconomic -- what it means when the League saves people in a richer neighborhood before a poorer one, or what the League allows itself to do when placed between an East African government and the refugees of its wars. Here again, the conflicts are manufactured -- the toxic spill that Priest shows the League powerless to clean up would be thrown into space by Superman under another writer -- but they demonstrate the fictions, even the privileged fictions, under which the League and its ilk are usually allowed to operate; conveniently the League usually isn't made to worry about which side of town it saves first. Into all of this, Priest brings his Deathstroke, from the riveting title where Priest does have dominion and where, like here, most events are shellacked in shades of gray. It is Deathstroke who provides the simple solution to one of the book's problems, murdering the Fan offscreen while the League bickers among themselves (at the point it happens, Batman is suggesting handling the refugee crisis by "creating a database" and fingerprinting everyone "to screen out potential terrorists"). This is a brutal jab at the League concept by Priest, showing an enemy baked in to the excesses of the League's origin who through their own moralism they are powerless to stop, and then at the moment when they're most in the weeds about another subject that can't even be unraveled in the real world, Priest suggests there are some problems the League can only solve with a gun (and moreover, that Batman might have employed Deathstroke's gun on purpose). The League ultimately needs Deathstroke to solve the refugee crisis too, to the point where to some extent this really becomes Deathstroke's book. Priest mitigates that, however, in answer to the question throughout as to whether the League charter should trump personal sentiment, in that Wonder Woman sets herself up as a "one-women no-fly zone" to protect the refugees -- valuing individual action over groupthink, but at least the individual is a Leaguer. In some respects Priest's conclusion to "Justice Lost" travels some of the same roads as his "Chicago" from Deathstroke Vol. 2: The Gospel of Slade, though here the individual breaks from the crowd to take matters into their own hands for peace, not vengeance. Priest's Deathstroke is eminently entertaining but does not always have the leeway to be directly comedic; in contrast, some of the running gags in Priest's Justice League remind of his Steel (criminally uncollected) -- for instance the ubiquitous patter of Green Lantern Simon Baz worrying over a lunch with Superman. At the same time, this was a lot of run-up just for Simon to leave the lunch in a huff with no real conversation given. That Catwoman Selina Kyle is wholly unperturbed about Batman and Lantern Jessica Cruz's kiss, and invites Jessica to come in and watch Real Housewives, is also a weird moment, but probably also the best Priest could do short of, again, resolving it grandly in some large multiversal event. One does wonder if Priest was working with fewer issues than he might have expected. I "get" Christopher Priest's Justice League run better after Justice League Vol. 7: Justice Lost. Priest's 10 issues are a deconstruction of the best kind, one that takes everything that "can't" happen in a DC Universe comic book and makes it happen, then has the further courage to let these vaunted characters stand around looking helpless about it. When we talk about breaking new ground, perhaps this is the point we've come to. 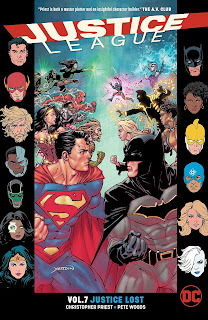 In the League's forthcoming new iteration, where Batman is assuredly always right, Wonder Woman bulletproof, and the League doling out justice for all without difficulty, I expect Priest's run to stick in the back of my head for a while. "One does wonder if Priest was working with fewer issues than he might have expected." I loved Priests short lived run on this title. It was such a fresh take to the Justice League book in a very long time (It actually reminded me a lot of the 97 JLA run that started with Morrison. Maybe a bit more like Waid). I was crushed when JL came to an end and Snyder took over it after Dark Nights Metal. I like his writing, and it'll be good for a JL book I'm sure...but his style is like what we've been getting for the last 7 years on the JL book. Big action blockbuster with maybe a ponder or two. Whereas I felt like Priest brought it back down to where the book is most interesting and that's these Superheroes coming together, and solving problems while messing up, rubbing the dirt off, and getting back up again.